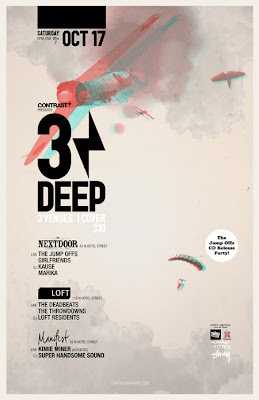 Just another friendly reminder about 3 Deep going on tonight by Contrast Magazine! All of your friends will be there, your friends friends. People you haven't seen in a long time. Plus its the launch of Contrast's Issue 02 Downtown! It's also The Jump Offs CD release party...so don't miss it! Chee!